This was my first visit to Brookfield Park and it was a morning to remember. I had a fantastic time! The visit kicked off with an author assembly in the hall. 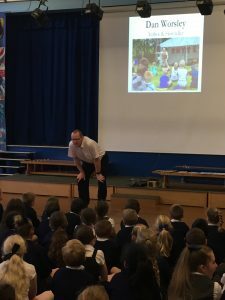 It was a joy to share my writing adventure with Year 2 – 6. They discovered the process involved in writing and editing the books, along with the illustrative wizardry created by Martin. 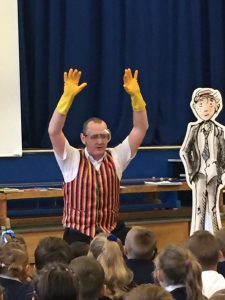 I even put on the storytelling waistcoat to perform one of the Tales. Next stop was Year 5 for a writing workshop. We discussed nasty characters from books the children had read before focusing on an unpublished extract I’m paying around with. It features a character called Bazza Simmons. The children pulled apart my writing and after lots of discussion time, set to work planning their own version of my character. It was a great session and the children were ace! After hot-footing it to Year 6 I delivered the characterisation session again. The children worked brilliantly and I have faith that they will produce some fab writing. The visit concluded with a book signing. 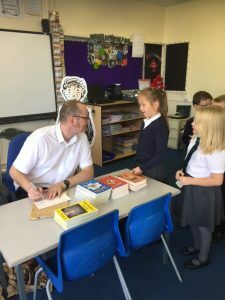 It was great to sign some books and chat with the children. Thanks must go to Mrs Whiteside for organising the visit and promoting the signing so effectively. 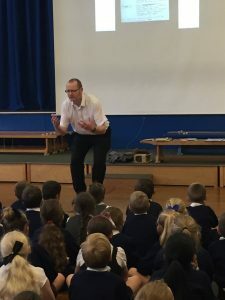 I had a top time at Brookfield Primary and hopefully I’ll get to return again at some point in the future.